Bandhani work in India was mainly started by the Khatri community of Kutch, Gujarat. You can complement the saree with silver jewellery, colourful bangles and high heels. Made from Art Silk with 5.6 meter total fabric with blouse. 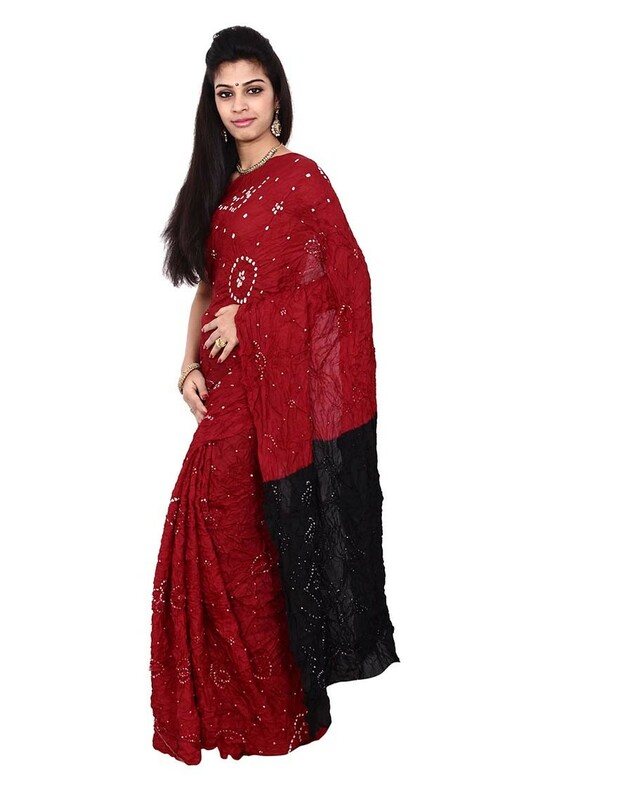 Kala Sanskruti synonymous with Bandhani, was established in the year 2011 and has been a leader in the textile and retail business for over years. An icon of Indian Culture , Kala Sanskruti has become synonymous with Bandhani or Silk sarees. Kala Sanskruti success story has a fairy tale ring to it. Started as a small retail store for Bandhani Sarees in Gujarat by a young man called Karan Shah in 2011, the family-run shop did steady business for years after which the Grandson, Kala Sanskruti bandhani Chet ti took over. In a radical departure from convention, Kala Sanskruti decided that the shop would do no discount selling, an unheard-of prospect back in the 2011. Since then it has been a pioneer in the field of Bandhani, leading the change for an entire industry. Kala Sanskruti soon built up an image of unrivalled quality at reasonable prices; its roster of loyal clients also grew multi fold. An year brand with considerable equity in the Gujarat , Kala Sanskruti is still the popular destination of choice for Bandhani , silks and wedding Saree today.Kala Sanskruti synonymous with Bandhani, was established in the year 2011 and has been a leader in the textile and retail business for over years. 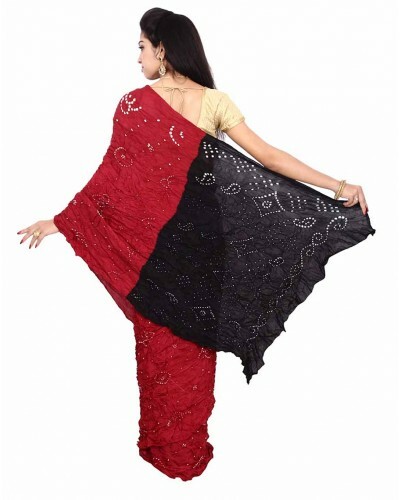 An icon of Indian Culture , Kala Sanskruti has become synonymous with Bandhani or Silk sarees. Kala Sanskruti success story has a fairy tale ring to it. Started as a small retail store for Bandhani Sarees in Gujarat by a young man called Karan Shah in 2011, the family-run shop did steady business for years after which the Grandson, Kala Sanskruti bandhani Chet ti took over. In a radical departure from convention, Kala Sanskruti decided that the shop would do no discount selling, an unheard-of prospect back in the 2011. Since then it has been a pioneer in the field of Bandhani, leading the change for an entire industry. Kala Sanskruti soon built up an image of unrivalled quality at reasonable prices; its roster of loyal clients also grew multi fold. An year brand with considerable equity in the Gujarat , Kala Sanskruti is still the popular destination of choice for Bandhani , silks and wedding Saree today. The art of Bandhani is a skilled process technique, literally meaning tying up. In this tie dye process, fabric is tied tightly with a thread at several points, thus producing a variety of patterns. Indian Bandhani began about 5000 years ago and is also known as Bandhej. 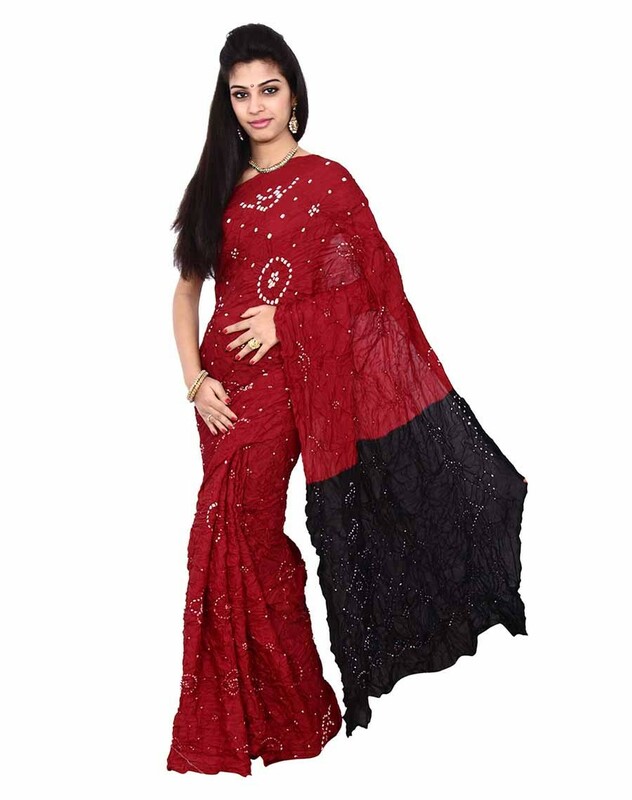 Enhance your beautiful look with this designer bandhani saree and gain the attention of all who follow its diverse prints and colors.Style it with minimal jewellery and high heels. It is traditional wear and can never go out of fashion especially during festive occasions and events. • Disclaimer: This kind of product is handcrafted and may have slight imperfection and/or mismatch from the product shown in the image as its handcrafted by the artisan which makes the product unique.